Step into STREAM and explore an inspiring conversation about flow states, higher-level performance, creativity, and the true nature of doing our best work. John Klymshyn and Isaac Naor offer insight into how to get into a flow state, how to spark creativity, and how to achieve a high-performing life. 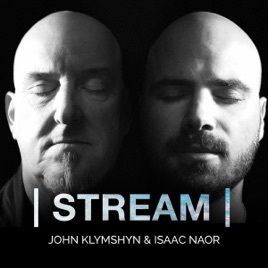 STREAM is a unique audiobook, best consumed from start to finish the first time you listen. Chapter titles point you to the jumping off point at each phase of this deep and far-reaching conversation. STREAM is an experience. STREAM opens your mind and connects you with how to do your best work. STREAM impacts listeners creatively, mentally, and emotionally. John Klymshyn is a musician, author, speaker, coach, father, husband, entertainer, and explorer. Isaac Naor is an inventor, designer, futurist, and fanatic for identifying, creating, and experiencing the moment and the after-effects of flow states. This audiobook is a moment in time and a timeless exploration of thought and action between two wildly creative people. It is designed to be listened to in part or in whole again and again and again. Open you creative mental windows. Bathe in creativity. Step into STREAM. Grow. Expand. Float. Flow. Step into STREAM. No matter your age, your interests or your stage within your chosen industry these illuminating and articulate conversations will open your mind in both expected and unexpected ways. Two smart, well spoken, erudite and engaging men developed STREAM as an invitation to "us" to explore the learnings of creative thinkers who generously give of themselves to inspire, sometimes provoke and ultimately teach life lessons on a real and attainable way. STREAM is a must! Isaac and John are extremely entertaining and informative. I love how well they feed off each other and provide great knowledge, depth, and insight to the topics they cover. Can’t wait to see/hear what else they collaborate on! !